SEGUIN – Southwestern’s offense was sensational as the Pirates won 3-0, 3-0 over Dallas and Centenary. The win puts SU firmly in third place in the conference and just one game out of first. In the first game of the day the Pirates didn’t allow any hope to the Crusaders as they rattled off three straight wins, 25-14, 25-19, 25-15. Kaitlyn Foster led the attack with nine kills while Olivia Drummond added eight and Abbie Robb andMacey Pool seven each. Pool led in digs with 19 and Kaitlyn Corbett added in 17. Southwestern’s offense was blazing in game two as the Pirates dominated Centenary. SU didn’t hit below .324 in any single match and allowed only 45 points combined in the three sets. Drummond was unstoppable, leading Southwestern with 12 kills on 17 attempts with no errors for a .706 attack percentage. Kate Mitchell and Robb had banner games as well with .538 and .467 attack percentages respectively. 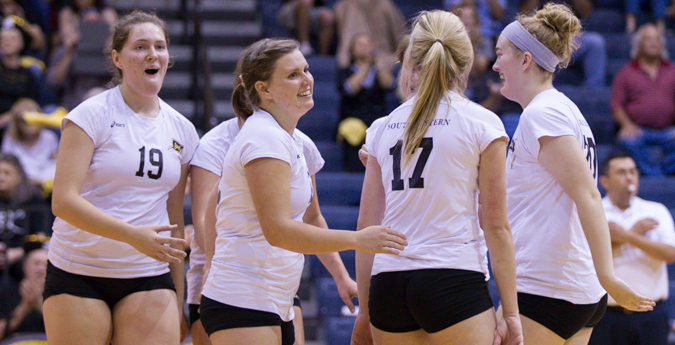 After the pair of wins, Southwestern improves to 18-8 on the year and 8-2 in the SCAC. They remain in Seguin to face nationally-ranked Colorado College at noon and Austin College at 2pm to close out SCAC regular season play. SU is currently in third place in conference and trail Trinity and Colorado College by one game.